Almost two years ago I took a creative writing course. I didn’t expect at that time that it would be so relevant to Knowledge Translation, but I have come to realize that it really is. I remember during graduate school, as researchers-in-training we were taught to be able to ‘tell the story’ in our data, meaning, how think analytically or be able to describe the patterns in your data. Being able to tell the story that your data were telling you was necessary no matter whether it was a quantitative (statistical analysis of numerical data) project or qualitative (analysis of words, text). But beyond this, when it comes time to tell the story of your research project as a whole, you need to become Batman. “Becoming Batman” means you can think of yourself as the protagonist (see #4 below) in the story of your research project when you are developing your messaging for your KT products. The KT Core recently produced an Infographic Guide. It requires the research team to sketch out the ‘story’ they want to tell about their research. It occurred to me post-production that maybe some further pointers were needed for how to do that, and became the inspiration for this blog post. 1) Time: how much time is being covered in your story? With respect to your research project, how long as the problem (see: #4 antagonist) under study been an issue? You need a containable frame of time. What was the time frame for your study? Is there a timeline? Was there a short timeline within which you had to solve this problem? What were the macro segments of time (the overall timeline from beginning to end) and what were the micro segments of time (time it took to interview respondents)? You need to decide what will be the beginning of the story, and what will be the end. Make the time frame clear. Will you start to tell the story from before the project began, when you consulted with stakeholders to find out what they needed and formulated the research questions in order to figure out what the solutions could be? Or will you start telling the story from when you successfully received a research grant to investigate your questions? Is this something that occurred in the past? Over the past week? Over years? Are you telling the story in past tense or present tense? Be aware of how much time (e.g. in a video) or space (in an infographic) you have to tell your story – if you only have a small amount of time or space, you are bound by that so keep the story within these constraints. You can’t cover everything, and the amount of time or space will never be enough. But make a decision what you actually want to cover. 2) Place: In your story, where is your research taking place? Place is very important to the story, is it clearly defined or mentioned? How has ‘place’ affected you and your role in the story of your research? What are the people like? How has it influenced who you are, how you do your work? Make sure your interaction with ‘place’ is part of the story you are telling. 3) Antagonist (villain): you can’t write a story without an antagonist, the antagonist is absolutely crucial to your story. But in your research project you won’t be talking about how (you as) Batman defeated the Joker. An antagonist in a research project can be an illness, disease, societal issue you want to understand or solve, or a phenomenon (like a discovery you want to make). Describe what your antagonist is. What is the problem you are investigating? Is your antagonist internal (you are struggling to overcome your own curiosity, your personal issues and/or health problems) or external (are you investigating a community or societal issue, an environmental plague, outer space, etc.)? It should be readily apparent to the reader what it is you are up against. How did you (or are you planning to) overcome it? This will be your research methods. 4) Protagonist: The protagonist is the ‘hero’ or main character. This would be you, the researcher. You are Batman. You and your research team are working towards overcoming the ‘antagonist’ or problem you are investigating. How are you different now at the end of the project than you were at the beginning? What did you learn? Discover? You can’t have a little of both – it is absolute – you either overcome the antagonist or you succumb to it. Did you overcome the antagonist (solve the problem you were investigating, make the discovery, answer your research questions) or did you succumb to it (the project did not yield results and further research is needed)? In storytelling this is known as the cathartic ‘release’, the recipient of your story is waiting to see whether it is going to be one or the other, and gets the same amount of pleasure out of the story whether you succeeded or failed. The reason why people are interested in your story is to find out what happened, to get that cathartic experience. In order to motivate the reader to action, you need to find a way to get that emotional reaction. You have a fascinating research project. The trick is to be able to convey what’s important to you about your research, to someone else. What is at stake for you? For society? Make sure the stakes are high enough, this makes the story more compelling. What would happen if you hadn’t done this research project? Food for thought for the next time you create an infographic (or really any KT product). What is the story you are telling? Does your ‘story’ evoke an emotional reaction? If the answer is yes, you will be more likely to motivate the reader toward action (e.g. changes in policy, practice, and/or personal behaviour) and isn’t that the reason why we do KT? This week’s guest post comes from York University’s ResearchImpact Blog, MobilizeThis! It was first published on April 22, 2016 and is reposted here with permission. Last updated in 2013 (so not new, but new to me), DFID UK has produced a guide to aid in research uptake. This guide helps researchers work with stakeholders to maximize the opportunities for research to be taken up and used by organizations making new products, developing policies and/or delivering services. Using this guide will help facilitate stakeholder engagement to enable research uptake. Le ministère du Développement international du Royaume-Uni, le DFID, a mis à jour en 2013 (pas franchement nouveau, mais pour moi, oui) un guide pour faciliter l’exploitation des travaux de recherche. Ce guide aide les chercheurs à collaborer avec les intervenants, dans le but de maximiser les occasions d’utiliser la recherche dans la fabrication de nouveaux produits, l’élaboration de politiques ou la prestation de services. Grâce à ce guide, on aura plus de facilité à convaincre les intervenants d’exploiter activement les résultats de la recherche. We all know (or we all should know) it is important to engage end users (especially lived experience) upstream in the research program. How else do you know your research is going to help meet the needs of people who can benefit from the policies, products and services that are enabled by your research? The private sector calls this consumer driven design. Communicators always advocate knowing your audience. Knowledge mobilizers call this stakeholder engagement. There is literature on stakeholder engagement (see KMb journal club post). There are methods like the policy dialogue (see another KMb journal club post). Jonathan Weiss (CIHR Chair in Autism Spectrum Disorders Treatment and Care Research, York University) embeds stakeholder engagement in the work of his Chair and reports annually on his efforts (see his 2014 Annual Report as an example). But where is the help to help the rest of us? A researcher in the NeuroDevNet network recently forwarded a guide for research uptake. Research uptake is that moment when a non-academic research partner seeks to take the results of the research in house to inform decisions about their own policies, products and services. This is a critical step in mediating the pathway from research to impact. And effective stakeholder engagement can facilitate this moment of uptake. Capacity building: not all non-academic research partners have the capacity to take up research evidence. Building capacity for end user uptake is an important element…but is this the job of the researcher or possibly for allied intermediary organizations? Communicating: synthesizing results, planning communications and publishing research results in accessible formats are all important to facilitate research uptake. Monitoring and Evaluation: create a logic model including indicators to measure progress at each stage, gather data and feedback results into your research and research uptake processes. Really? I believe research institutions need to strive for neutrality but researchers themselves are often highly invested in a particular policy position. Why else do media channels ask academic researchers to comment on government positions? While research methods strive to remove bias from the evidence, that unbiased evidence is not necessarily value free from the researcher’s perspective. And a note to ResearchImpact-Réseau Impact Recherche universities and other institutions with a knowledge mobilization mandate…. we don’t have discipline specific stakeholders but we do have institutional stakeholders such as United Way, community associations, municipal and provincial partners, Chambers of Commerce, etc. These institutional stakeholders should be part of our own stakeholder engagement efforts. Thanks to Anneliese Poetz, Manager KT Core, NeuroDevNet for passing this along and for writing about her own tips for stakeholder engagement on the NeuroDevNet Blog, KT Core-ner. What do the acronyms TEDx, ASD and iKT have in common? Source: What do the acronyms TEDx, ASD and iKT have in common? This week’s guest post comes from the ASD Mental Health site, Dr. Jonathan Weiss’ Blog. It was first published on April 13, 2016 and is reposted here with permission. On Saturday May 28th, the Chair in ASD Treatment and Care Research will be hosting Spectrum, a TEDxYorkUSalon focussing on concerns relevant to transition-age youth and to adults with Autism Spectrum Disorder. When the Chair was first launched, we asked stakeholders (e.g. people with ASD, clinicians, family members, policymakers, and researchers) how they wanted to be engaged with, both in terms of what we’re doing, and what was going on in the Canadian field of autism research. The message was clear: we need more than one approach, for multiple types of audiences, including those we already knew as well as those in the autism community we had not yet reached. So how best to develop a dynamic, accessible, and efficient way of exchanging knowledge about autism across so many different perspectives? This is where TEDx comes in. Our upcoming event is part of our strategy of innovative knowledge mobilization and stakeholder engagement. Since knowledge translation is a learning process among stakeholders with different perspectives and expertise, we have involved people with ASD, parents, researchers, educators, policy makers, and service providers as presenters. The presenters will give short 8-minute talks which will be placed online following the event and made freely accessible to the public. The well-known and appreciated TED format is all about developing, refining, and sharing ideas in an entertaining way, both for those present in the physical audience, as well as those in a virtual audience who can access the talks worldwide. It’s a format, and a brand, that has tremendous recognition and a demonstrated ability to break down complex knowledge into a format that can appeal to a wide range of audiences: it’s open to everyone. Since our goal is share the knowledge that’s been generated in the Canadian autism community openly, we are creating broadly appealing content that will be available through the TEDx in-person and online platforms. We believe it will be an effective method to bring multiple perspectives together and listen to one another. How can you plan your own TEDx event? First, craft your vision and goals (10 months ahead of time). It’s important to think through and articulate your vision (how would you define success?) and then identify how you can evaluate whether and to what extent you achieved your goals. Our vision and goals were to: 1) make topics of ASD research accessible, 2) build enthusiasm about research and 3) expand reach globally to people living with ASD, students and service providers. This shaped the types of questions we asked on our evaluation forms. For example, we hope that the TEDxYorkUSalon event will lead to greater excitement, optimism and familiarity about Canadian research in ASD and with regard to how people view ASD more generally. We ask questions about these topics in an optional questionnaire when they register, and will do so again after the event, to measure individual change. As you begin this goal setting and visioning process, read the guidelines to know what goals are feasible. The TEDx Organizer’s Manual had many helpful tips and a step-by-step guide on how to organize an event like this properly. Since this is our first time, we had a steep learning curve. There are various guidelines for the different types of events. TEDx licenses are given to people based on location (e.g. TEDxNewYork, TEDxToyko, TEDxUniversityofLeeds, TEDxYorkU) and there are different guidelines for each event type with respect to: the number of attendees, types of sponsorships, branding of the event etc. We decided to run a Salon event under TEDxYorkU – a smaller event run under approved TEDx license holders because it allows us to explore a more specific topic rather than a general theme. Your vision and goals must align with the type of event – as that determines the structure that enables what you can do. Ultimately it’s crucial to stick with TED’s strictly prescribed format, which can be difficult for us researchers who are used to having full control over the design and execution of our own events. By choosing to go with the TEDx format, it meant letting go of some of that control. We learned that we had to be flexible – working with a brand with licensing guidelines, we had to adapt each time we were constrained by requirements. For instance, we had to ensure the number of presenters and attendees were approved and that sponsors were not related / perceived to influence/bias talk content. Further, we had to figure out how to brand the event properly – the Event webpage couldn’t be associated with our research brand (Chair website, ASDMentalHealth Blog, or even York University). We would encourage on-going communication within your team and those involved so everyone is on the same page. Looking for an appropriate venue, we kept in mind not only costs but accessibility for families – as well as technical requirements for our event (e.g. lighting, staging). With the depth and breadth of enthusiastic, passionate Canadian researchers, advocates and parents available, we had no difficulty finding individuals who could fit the TED requirements. Our speakers are up for the challenge, currently being coached to chiselling their passion, knowledge and experience into a tight 8 minutes. Similarly, finding partners and sponsors for the event was not a big challenge. Many organizations that shared the same vision of KT and gladly supported us, including the Faculty of Health at York University, NeuroDevNet, Kerry’s Place, Geneva Centre for Autism, Sinneave Family Foundation, and the Ontario Brain Institute. We worked with an expert at York University who has successfully run TEDxYorkU over the last few years (Thanks Ross! ), building on his success and his wisdom about what’s required in terms of advising speakers, creating an exciting schedule, space and technological issues. NeuroDevNet’s KT Core will be in attendance to engage with stakeholders and capture this engagement on video. Video taping of individual speakers is also being arranged through York University’s Learning Technology Services video team, who have had experience working with TEDxYorkU in the past and were familiar with TEDx guidelines. Overall, familiarity with TEDx guidelines, building a team (e.g. with sponsors, speakers, technical support) and having consistent communication with those involved within is important to create a successful event. The exchange of ideas and having different perspectives (not just researchers) is, after all, the point of doing iKT! For more information about this event, and how to register, please visit: http://www.tedxyorkusalon.org/ or contact Dr. Jonathan Weiss (jonweiss@yorku.ca) or Dr. Jonathan Lai (jonlai@yorku.ca) for details. The Chair in Autism Spectrum Disorder Treatment and Care Research is funded by the Canadian Institutes of Health Research in partnership with Autism Speaks Canada, the Canadian Autism Spectrum Disorders Alliance, Health Canada, NeuroDevNet and the Sinneave Family Foundation. Additional support from York University and ORION’s O3 Collaboration. Seeing the diamond in the rough: “Boaty McBoatface” a KT gem? I understand the argument not to keep the name: researchers are concerned that their rigorous and important work may not be viewed as credible if the vessel it is carried out with is donned with a name that started out as a joke. I believe this is a valid concern, however, I would like to offer a different perspective. As a KT professional, I am aware that KT-conscious researchers, as individuals and, as part of research networks and organizations, are constantly seeking for a way to raise awareness about their work, to create “sticky messages” that audiences will remember. Indeed, the effectiveness of any KT strategy begins with the ability to raise awareness about the project, the findings, the usefulness and potential application of the work. While awareness does not guarantee uptake and implementation, if people don’t know about the research, they can’t even consider using it. Awareness-raising for research projects typically aims to direct attention toward the evidence through dissemination activities such as: conferences, websites, social media. An integrated knowledge translation approach is based on relationship-building to both inform the research in progress as well as act as a spokesperson to spread the research findings (and hopefully facilitate their uptake and implementation of evidence-informed recommendations into practice and policy). Researchers, research networks, and organizations promoting evidence-informed decision-making sometimes seek spokespersons who are more broadly recognizable, to be ‘champions’ such as well-known celebrities or athletes. The reality is, it is very difficult to achieve the desired level of awareness or ‘reach’ of research findings that could maximize uptake and implementation. Capitalizing on the popularity of “Boaty McBoatface” can be an effective means to direct attention to the researchers’ social media channels, websites, for achieving broader awareness of the research evidence. Organizations have recognized the power of social media and try to create content that will be shared, and go ‘viral’, with the end result being uptake and implementation of their messages. There is a fine line between ‘gimmicky-ness’ that could reduce credibility and cause people to ignore it, and something that can go viral while causing effective uptake of evidence-based messages. The European Centre for Disease Control (ECDC) created a hedgehog mascot to help convey messages about public health. The United States Centre for Disease Control (CDC) launched a “Zombie Apocalypse” twitter campaign that ended up being so successful it crashed their website from visitors who wanted the information on emergency preparedness. The NERC’s “name our ship” website crashed this past weekend due to the amount of traffic. I can only think of this kind of public attention as something positive (for their KT), in fact, it is a rare and unexpected gift to the ocean researchers at its helm. 1) Start Early: You need to start planning at least 6-8 months in advance of the date you plan to hold your event. At this stage you should know: why you need to hold a stakeholder consultation including a general sketch of what you need to know from your stakeholders. Once you know this, you should also be able to roughly sketch out the categories and types of stakeholders you need to invite. Starting early is especially important if you plan to invite Chief Medical Officers of Health, as they need this much notice to be able to get it into their calendars. 2) Write a purpose statement: A purpose statement should be broad and should clearly establish the overarching goal of the meeting. Once you know (as in #1) why you need to hold a stakeholder consultation this will be relatively easy. The purpose statement quickly summarizes why you are holding the meeting, but should include information such as: i) what is the nature of the meeting (e.g. ‘…to provide a forum for information exchange and open discussion….’), ii) who will be attending the meeting (e.g. ‘…between public health practitioners and researchers…’), iii) what the outcome of the meeting is intended to be (e.g. ‘…how current knowledge on partner notification could be incorporated into practice and how knowledge gaps could be addressed’). In this way, it gives participants a quick overview of what the meeting will be about and why their input is important toward achieving the meeting’s outcome(s). To provide a forum for information exchange and open discussion between public health practitioners and researchers on how current knowledge on partner notification could be incorporated into practice and how knowledge gaps could be addressed. 4) Link all of your documentation: all documents for the meeting including (but not limited to) the meeting agenda, invitation letters, consistent breakout group/report back forms, evaluation forms should repeat the purpose statement and objectives at the top. Before the event, it helps the meeting organizers and planners to ensure activities are aligned with the purpose and help to achieve the meeting’s objectives as these various documents are being drafted and reviewed. At the event, it shows your attendees that you respect their time by having prepared a seamless and well-organized meeting package (the final documents should also be formatted uniformly). It also helps to ground the meeting as it unfolds, and provides a visual reminder to facilitators and participants of the purpose in case the discussion(s) begin to veer off track. It is especially important to ask participants on the evaluation forms how well they believe the meeting achieved its objectives. 5) Draft an agenda before sending out invitations: your invitees will likely have to book time off work or otherwise rearrange their schedules to attend your meeting, so they need to be able to determine whether their attendance can be justified. In many cases they will need to show the agenda to their employer (which is one reason why it is important to state the purpose and objectives at the top of the agenda) in order to gain approval to take leave from the office to be able to attend. 6) Piggyback onto another event: a popular option for conducting a stakeholder consultation is to tack it onto another event such as a conference that you know there is a good chance your stakeholders will be attending. This greatly cuts down on transportation costs, because if you are paying for your participants’ travel expenses all you have to do is pay for an extra hotel night instead of paying for their airfare as well. The only tricky part is that if the conference is not being coordinated by your own organization it can be difficult to gain access to the attendee list. If you don’t know which of your stakeholders will be attending it can make it a little more difficult to extend invitations strategically. However, you can also target local stakeholders in the city where the event is taking place; if you reach out and ask those stakeholders to come to your consultation it doesn’t really matter if they are already attending the other event because there will be no airfare/travel costs for them to attend anyway (the only expense will be food but you would have to provide that anyway). 7) Have good food: it’s the least you can do to thank people for their attendance, and it makes the day that much more enjoyable for them. Plus, the benefit to you is that your attendees will be able to think/ provide better input for you if they have had enough (and good) food and coffee. I usually ask the venue caterers to leave the coffee/tea and food out (as opposed to coming and picking up the food right after lunch) so people can ‘graze’ if they get hungry or need to be caffeinated throughout the meeting. If you are a NeuroDevNet researcher or trainee and would like advice on how to plan your stakeholder consultation (or other stakeholder engagement activities), contact the KT Core. It is common for KT activities to be limited to dissemination of KT products such as research summaries, infographics or research reports/articles. Sometimes these products are created without consulting the stakeholders who represent the intended target audience, and what is typically measured and reported on is the numbers of these products distributed. Dissemination is necessary, but usually not sufficient, to create impacts from research. The two main approaches to Knowledge Translation are end-of-grant (dissemination) and integrated Knowledge Translation (stakeholder engagement/consultation). The evidence on successful KT has demonstrated that iKT approaches are more successful at creating impact. When I think about iKT I am reminded of the topic of my PhD dissertation which focused on a process analysis of a stakeholder consultation approach for informing government decision-making. One of the frameworks I cited in my literature review was Arnstein’s (1969) ladder of citizen participation in community decision-making within the context of the ‘broader power structures in society’. Arnstein’s (1969) ladder of citizen participation ranges from one extreme to the other, at one end citizens have all the power and at the other end they have no power at all. Citizen power is sub-divided into “citizen control, delegated power, and partnership” (citizens have all/greater power) while tokenism is represented as “placation, consultation, informing” and non-participation in community decision-making is referred to as “therapy and manipulation” (non-participation, no power). An iKT approach is important for maximizing the uptake and implementation of research, toward impact. Recently, I found myself wondering how Arnstein’s ladder of citizen participation could map onto a research decision-making context. For example, when a researcher takes an iKT approach to their work, they inform their research questions, methodology, KT products (type, key messages, delivery method, etc), workshops and other activities (toward moving their research findings into uptake and implementation) by using information about their stakeholders’ needs as a result of careful observation (of stakeholders as well as the current state of society, industry, government etc.) and listening to stakeholders. However, as the subject matter and research process expert, the Principal Investigator/researcher (has to) use discretion in terms of how, where, and why stakeholder input contributes to the overall design and execution of their research (assuming stakeholders are non-researchers). In this way, it is unrealistic to expect that citizens/stakeholders should be given complete control. Even if stakeholders are researchers themselves, the Principal Investigator (PI) of the project has obligations (for example) to the funder of their research to reasonably deliver what was promised in their initial grant proposal. In this way, the PI can be viewed as having more power than their stakeholders in terms of the research process. However, in order for planned KT activities to result in successful uptake, implementation and impact of research, stakeholders need to feel that: they have been heard and their input is valued; their (information and other) needs are being met by the research project; the KT product(s) created will be useful/helpful to them and/or their clients. In this way, stakeholders have potentially tremendous influence over the PI’s ability to achieve change through their research output(s). Persuading successful partnership engages stakeholders so that research can, should (and will, if possible given their organization’s capabilities) be used in practice and policy. Often, they must surmount potential barriers such as stakeholders’ experiential (and other) knowledge, values and job descriptions as well as political and financial restrictions. According to Arnstein’s ladder taking an integrated approach to KT helps to shift the power from researchers toward stakeholders, and into the “partnership” stage during which both stakeholders and researchers (PIs) redistribute power. Stakeholders become more open to using research in practice and PIs become more able (through understanding stakeholder needs) to make the necessary adjustments to their research and KT approaches to enable uptake and implementation by these stakeholders. It is reasonable then to say that effective, integrated KT takes place at the “partnership” level of Arnstein’s ladder. This week’s blog is written by Stacie Ross, KT Assistant for the KT Core of NeuroDevNet. NeuroDevNet’s KT Core has been producing our ResearchSnapshot clear language research summaries since 2014. We have 39 ResearchSnapshots posted on the NeuroDevNet site neurodevnet.ca. 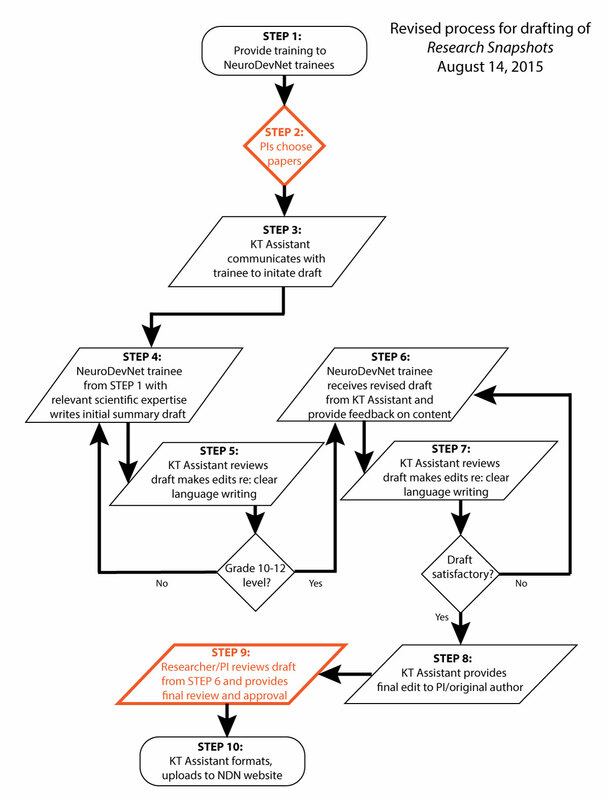 Responding to feedback from our researchers, we revised our process for clear language writing to take advantage of the expertise of our trainees who are close to the research being summarized. Listening to our researchers allowed us to implement a new process that streamlined and simplified the writing process while at the same time created a ResearchSnapshot that more accurately reflected the original research being summarized. The result will be a more succinct and easy-to-understand review, and trainee writers who have developed clear writing as a new skill and produced clear language research summaries can place these non-academic publications on their CVs. Trainees are encouraged to review our process and think about whether they would like to work with the KT Core, to create a clear language summary of either their own peer-reviewed publication or one from their supervisor. The detailed process was designed through a few meetings, incorporating feedback, and testing logistics. The umbrella process without all of the details is really four simple steps for us. Create an instructional webinar on how to write clear language summaries. Invite our NeuroDevNet trainees to the webinar/to view it online afterwards. Put out a network-wide call for papers. Send regular reminders to the network to submit papers. On August 14th, 2015, we held a webinar to inform NeuroDevNet trainees about clear language summaries and how to write a ResearchSnapshot. Michael Johnny, Manager of Knowledge Mobilization at York University and Anneliese Poetz, Manager, Knowledge Translation (KT Core) outlined just how important design and clear language are for the reader to be able to understand the science behind the ResearchSnapshot. The webinar was a success with great comments received through an online survey afterwards. We will seek to address this valuable feedback in future training sessions. As I am new to NeuroDevNet, I enjoyed being a part of the webinar and getting to know the process and clear writing expectations. View the webinar to learn about the value of clear language. I am looking forward to creating many more ResearchSnapshots and contributing clear language summaries that can speak to diverse stakeholders and provide them with the information they need to make decisions, to be informed, to provide care, to access more information. Dr. Jarred Garfinkle’s ResearchSnapshot, “How Much of Cerebral Palsy is Caused by Genetics,” will be a clear language summary of Dr. Maryam Oskoui’s publication, “Clinically relevant copy number variations detected in cerebral palsy.” This will be my first ResearchSnapshot that I have coordinated. The draft is in, it’s terrific, and the process has been smooth and simple thus far. With the support of the online webinar, the existing ResearchSnapshots for reference, the knowledge mobilization writing guide, and myself and the entire KT Core, bringing evidence into practice is proving to be efficient and effective and exciting! If you are a NeuroDevNet researcher or trainee and have a peer-reviewed publication you’d like to translate into a ResearchSnapshot clear language research summary, contact the KT Core.